It’s getting easier for small injection molders with limited capital to participate in the rapidly growing medical plastics market. Sumitomo(SHI) Demag (Schwaig, Germany) is advancing a previously developed concept now called activeCell, which is a self-contained injection molding Class 10,000 cleanroom. It includes a platen-mounted six-axis robot, laminar airflow cabinets for particle-free air around the mold, and built-in packaging capabilities. The system is available in 100, 160, 220 and 280 metric ton formats and combines technologies from the company’s UK-based technology partner Motoman (robotics), AVT (packaging) and Max Petek (laminar flow hood). The Motoman is a six-axis robot. Qualifications include GAMP (Good Automated manufacturing Practices) and U.S. Food and Drug Administration requirements, as well as design qualification (DQ), installation qualification (IQ), and operational qualification (OQ) documentation. Flowers say that the system maintains its Class 10,000 cleanroom environment with the aid of a laminar airflow system that floods the mold surface and part handling areas with high-efficiency particulate air (HEPA) filtered air. “Over and above its primary (pick-and place) purpose, the six-axis robot offers secondary operations including assembly and palletizing—a value-add for manufacturers looking for expansion options and fast payback,” adds Flowers. Another aspect of the activeCell is an AVT-integrated system that bags multiple products in the controlled conditions before they exit the machine. Operating as a system integrator, Sumitomo (SHI) Demag coordinates the project. The company showed a different version of the concept at Medtec Europe last year. 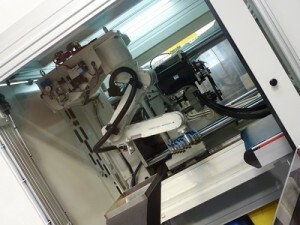 In another demonstration of interest in the medical market, Sumitomo Demag will show at Fakuma 2012 (Oct 16-20, Friedrichshafen, Germany) what it describes as a “high-tech application from the field of medical technology” using a compact production unit based on an IntElect 50-45. Detailed information will not be available until Fakuma.